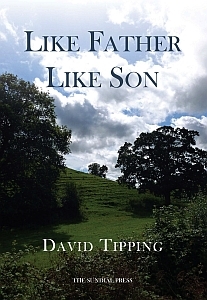 Like Father Like Son is a tale of domestic disruption and intrigue spanning the course of a year in the not-so-sleepy Dorset village of Lynchets Wood. Former diplomat Harold Ingram lives in contented retirement with his wife Thelma – until an old colleague from his Africa days turns up and drops a bombshell. Residing nearby in professional limbo, their son Luke contemplates his future after many years in Hong Kong, but like his father suddenly finds, as he embarks on a casual affair with a family friend, that the past cannot be so easily left behind. In a kind of narrative hopscotch, the novel skips lightly among the emotional entanglements of the main characters while embracing a full cast of minor ones as well, from the right-minded eco-bore Michael Green to the no-nonsense spinster Hermione Bodleigh, determined to get her man. Good-humour and civility win out, yet the novel’s comic element - its sprinkling of wit and touch of farce - is tempered by a note of melancholy that underlies the compulsions of sexual licence and the simple passage of time. Above all, Like Father Like Son is a story of how, through the unencumbered virtue of honesty, the present can be made to accommodate the past, and the future faced without trepidation. “The main spur to Like Father, Like Son came while reading my way through the novels of Ivy Compton-Burnett. I greatly admired her style and asperity of wit. My interest was further enhanced by Hilary Spurling's splendid biography. I had always hoped I could write a novel, and decided to try my hand at a contemporary take on Compton-Burnett. Mine is clearly a lighter version; I did not want the darker side of her tyranny-in-the-family theme. There are several allusions that the reader familiar with her work will pick up, but will otherwise pass unnoticed. I must say that, contrary to the familiar picture of the artist agonising over his work, writing this novel was one of the most enjoyable things I have ever done. I became very attached to my characters. 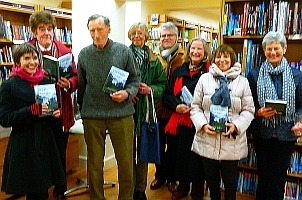 The novel follows the life of three generations of a family and their friends in a Dorset village. It is framed between the two Februaries when they gather for a regular annual party. Harold Ingram is a retired diplomat living with his wife Thelma. She is a devout church-goer, he a logically minded atheist. The result is frequent banter with a sharp humour, with no harm to an underlying mutual affection. Their son, Luke, after sudden departure from making money in Hong Kong, has to decide on a future life. He has also to refresh his relationship with Leo and Margaret, his teen-aged children boarding at a nearby school. The sudden discovery that there might be another Ingram or two in the world causes initial tension, which is unwound as the story progresses. Other themes develop with other characters. Tom Foster, the rector, and his wife Dorothy are bulwarks of village life. Rupert and Penny Hall are an ambisexual couple with their own personal dramas. Minor characters appear in sketches that add some humour to the backdrop of village life. Lynchets Wood is obviously West Dorset, and St Giles sounds very like Sherborne. ORDER BELOW for immediate dispatch. 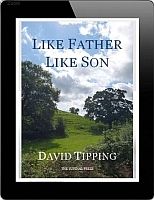 LIKE FATHER LIKE SON is now available as a Kindle book which can also be delivered directly to an iPad. 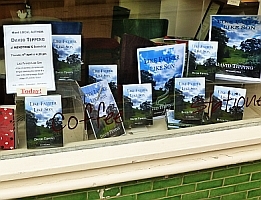 A light, easy, read, Like Father Like Son will ease you into the lives of the inhabitants of Lynchet's Wood - an apparently sleepy Dorset Village. Then just when you're comfy, drinking tea in the sunshine... the past wanders in to complicate their lives. Old indiscretions and news alike serve to accentuate the relationships within the village and adds a level of intrigue to the characters. 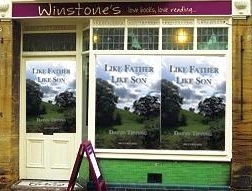 Written with a light touch, a genuine feel for a village populated by real people, and seasoned with easy humour - Like Father Like Son is a gentle read, perfect for lazy summer days. Thoroughly enjoyed this book very much and wanted to read more. I found the story and characters engaging, interesting and believable. I enjoyed the lightness of the writing and the humour. Definitely recommend this book. Suitable for any reader. This is story telling at its best. David Tipping is never predictable and writes with great speed, which reminds the reader of Isaac Babel and Garcia's Hundred Years of Solitude. He writes matter-of-factly; emotions are within a narrow bandwidth and left to the reader to fill in. The title story "Geraldine" is one of the best in my view; “Discovering” and “Oh, The Children!” are also exceptional. In the latter he breaks an old taboo, about relationships between a brother and sister. The films “Lovers of the Arctic Circle” (of Julio Medem) and “The Dreamers” (of Bernardo Bertolucci), two of the best three contemporary directors (the third one being of course Almodovar) have the same issue as a subject; other than that I have not come across it in literature or film. I also admired 'Neighbours', 'The Lecturer', 'The Mysterious Mrs Wilmington', 'Circles' and 'Nathan'. Some stories are science fiction, revealing the broad scope of the author. A book to recommend and to be left on the shelves!